Dr. Ron DeHaven, AVMA chief executive officer, encourages pet owners to make a New Years resolution for their pets. About a third of all cats and dogs are overweight and obese, and this exposes them to many diseases and joint pain. Dr. DeHaven explains that your veterinarian can help you easily slim down your pet for a longer, happier and healthier life. 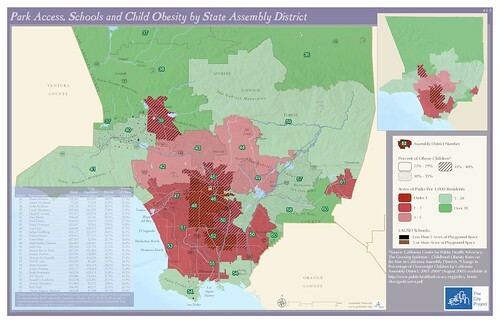 Levels of child obesity range from 23 to 39% in Los Angeles County, as shown in Map 403. There are unfair school, park, and health disparities in Los Angeles. Children of color living in poverty disproportionately lack access to parks, to school fields, to healthy food in grocery stores and restaurants, and to cars or transit to reach parks, schools, or healthy foods. They suffer from the highest levels of child obesity. The health implications of the lack of places to play in parks and schools are profound. In California, 73% of fifth, seventh, and ninth graders did not achieve minimum physical fitness standards in 2004. In LAUSD, 87% of students were not physically fit. Yet in 2006, 51% of school districts monitored in California, including LAUSD, did not enforce statutory physical education requirements. At LAUSD’s South Gate High School, 1,600 children took the state Fitnessgram test and not one passed. Forty schools did not have a single physically fit student. Less than 10% of students were physically fit in nearly one-third of the 605 schools in LAUSD. Only eight schools had student populations that are more than 50% physically fit. Get the The City Project’s Policy Report Healthy Parks, Schools, and Communities: Mapping Green Access and Equity for the Los Angeles Region. HCG Diet Direct dieters are urged to sit down to dinner and spend it eating with their family. It may sound contradictory at first, but children and teens who sit down to eat with their families frequently have shown lower risks of obesity in various studies. (CMAJ, v.173(6)) HCG Diet Direct also promotes the additional family meal time benefits of introducing your family to healthy foods, healthy food preparation and HCG approved foods (although portion control isn’t recommended for family members not on the diet) It’s excellent exposure to healthy eating habits for the entire family. Other benefits that studies have indicated come with sharing meals frequently as a family are: children are less likely to smoke or drink alcohol or become involved with eating disorders. Children who frequently sit down to eat with their families are also more likely to excel in school and exhibit fewer behavioral issues. To get further information on HCG Diet Direct or the HCG Diet get in touch with Jenny Boynton by phone at: 1-602-330-7655. Or you can visit HCG Diet Direct at their website at www.hcgdietdirect.com. Better dinner choices at home for your family. www.10minutecook.com Healthy trucker tips part 2. Better eating habits saves money now because the food is actually cheaper and quicker than truck stop food. It will also save money down the road because of less health issues. So why put off eating more healthier any longer. Making healthier food choices make sense. You don’t have to go to extremes, simply change your normal habits to a healthier diet. Reward yourself on a set date once a week or month once you get down to your target weight. The key is to stop make excuses and to get started. Not next week, not when this or that happens but now.